Last week SPSS held their Directions User Conference in Chicago. During the conference it was announced that Oracle had been named the SPSS "Technology Partner of the Year". The award was given to Oracle for its joint work with SPSS in building integration between SPSS Clementine and Oracle Data Mining. This integration allows analysts to use the Clementine interface to build, browse and score models in Oracle Database 10g using techniques available with Oracle Data Mining. ODM algorithms, including Naïve Bayes, Adaptive Bayes Network and Support Vector Machines, appear as "nodes" in the Clementine interface. These techniques can then be used just like the other techniques that are native within Clementine. The Oracle Application Server 10g Release 2 (10.1.2) Patch Set 2 (10.1.2.2.0) is now available for download from Metalink (https://metalink.oracle.com/). This includes many features in Discoverer, primarily in the OLAP area. The patch number is 4960210. It is currently available on Microsoft Windows (32-bit) and Solaris Operating System (SPARC 64-bit). Other platforms will become available shortly. 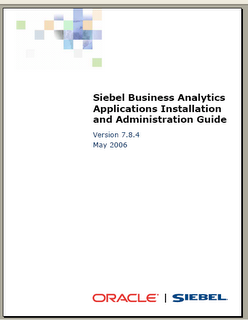 If you see the readme file, section 9.5.3 covers "New Features for Oracle Business Intelligence". These new features span Discoverer Plus, Plus OLAP, Viewer, Portlet Provider, and the Spreadsheet Add-In. Knowledge is power, or - "gyanadheenam jagat sarvam" - as the Sanskrit phrase (almost) similarly states. Whether the knowledge that 100 or 1,000 or 10,000 people visit the BI blog everyday is power that I can utilize is something debatable. Whether it is even 'power' of any kind is also a question. Sometime back I had wondered (link to blog post) about a sudden spurt in traffic to the blog. Now, blogging (work related as well as personal) is pretty much a non-monetizable activity (my compensation, reviews, and performance objectives are in no way tied to the popularity of this blog, though some may want to try and establish a negative correlation between the two), yet I do have some amount of interest in seeing that this blog gets more visitors than less. Someone suggested I turn to Google Analytics to find out why or at least "who". Google Analytics and StatCounter both provide lots of useful statistics. I personally find StatCounter to be more user-friendly, but Google Analytics lets me look at statistics over longer periods of time, not restricting me to only the last 100 hits for detailed info. Unsurprisingly so, the dominant platform for visitors to this blog is Windows (96%+), followed far behind by Macintosh, Linux, and Sun OS. When it comes to browsers, Firefox has a share (30%) disproportionate to its overall share (which hovers around the 10-12% mark). Along with Internet Explorer (64%), these two browsers pretty much are it. Opera, Safari, and others are far behind. The situation is slightly more varied when you combine browsers with platforms; it is apparent that Windows XP is the most popular OS for visitors to the blog. Various versions of IE & Firefox on XP made up 75% of the traffic. I was surprised to see both IE7 and Firefox 2 (neither of which were officially released till a few days back) make up more than 5% of the traffic. No surprises here - almost every browser was Java enabled. 32 bit color is the standard - wonder if people really don't know they can switch down to 16 bit color (and thereby improve performance, if only a wee bit), or that graphics memory is now available in hundreds of megs for people to not really care (I have seen some new desktops at work with something like 200 megs of video memory!). Everyone has Flash installed - even the latest versions: 8 and 9. 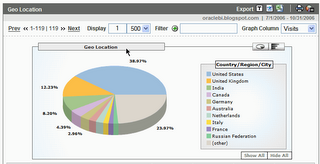 Of the 119 countries that this blog has seen hits from, more than half come from the US (38%) and UK (12%). Only India (8%) and Australia (2%) are the non North American or European countries in the top 11 list.